The number of people killed when a lorry ploughed into crowds in the French city of Nice on 14 July has risen to 86. A French government official said a man who had been injured in the attack on the Promenade des Anglais died of his injuries. The man, who has not been named, leaves behind a wife and two children. The attack, which has been claimed by so-called Islamic State, was carried out by a Tunisian man living in France. 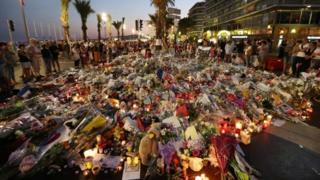 Eighty-three people died on the night of the attack on Bastille Day and three have since died in hospital of injuries sustained when Mohamed Lahouaiej-Bouhlel drove a lorry into celebrating crowds. Among the dead were 10 children and teenagers.